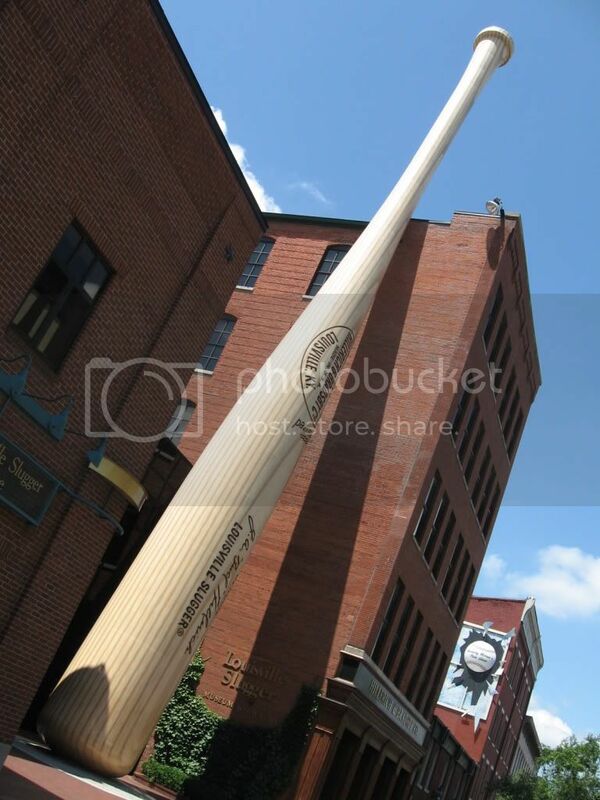 The giant bat outside the Louisville Slugger factory. Grape Cottage, for the win! Fourth Street Live!, early on a Friday night. Friday saw another generally problem-free trip, this one into Louisville. I did take a supply stop at a Wal-Mart; that included copies of my car keys so there won't be a repeat of Cincinnati. The first stop of the day was the Louisville Slugger Museum & Factory. They actually take you through the factory and show the step-by-step process of making bats. The machine that makes the bats for Major League players has a thousand templates, and can meet specifications within a hundredth of an inch. And everyone gets a mini-bat to take with them. I enjoyed it. After a brief trip across the Ohio River into Indiana for lunch, I made my way to Churchill Downs. Showing up just before two, I was unexpectedly early; on Fridays, the first race goes off at 2:45. Wandering around the paddock, it was easy to tell who was seriously into the thoroughbreds, vice the more casual fans. The clothes say it all. On Kentucky Derby day, the television cameras bring us the images of men in expensive suits and women in sun dresses...and giant hats. And even on a lazy Friday, there were a few of them at the Downs. In the first race, I wagered on a long shot; he finished dead last. When I placed my bet for the second, the horse I chose was the second choice, but the odds fluctuated wildly. When Grape Cottage bucked a little bit in the paddock parade, I felt good; I figured he had a lot of energy. And sure enough, he made a late charge on the front stretch to take the win. 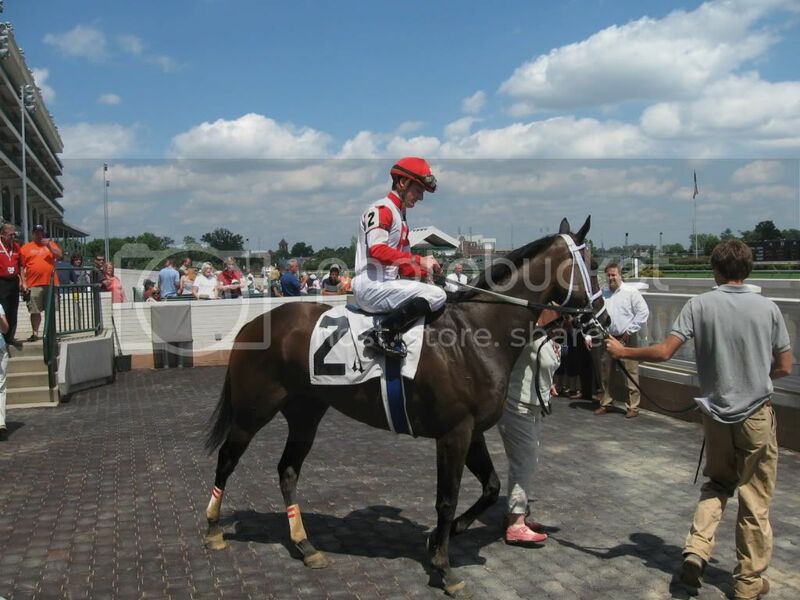 I stayed for two more races, but was done with betting, content to stand on the win I had. Overall, I was up two dollars on departure. 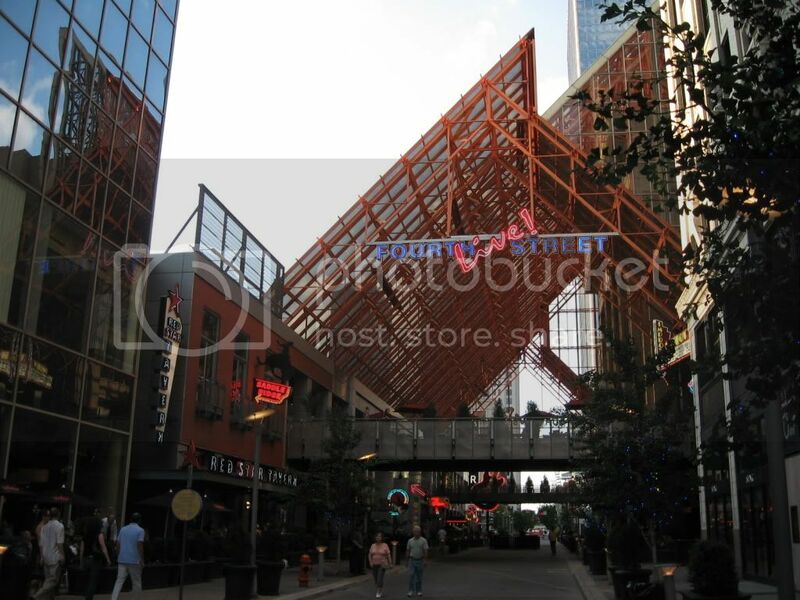 I drove back into downtown Louisville to check into the Brown Hotel. This was where Orlando Bloom's character stayed in the film Elizabethtown, and it was certainly an elegant place. And you certainly get a feel for the pulse of Louisville when you look on the dresser and see such magazines as Horse Society and The Bourbon Review. After showering, I walked north towards Fourth Street Live!, a block full of bars and restaurants that becomes a pedestrian mall at night. I ate at the Sports and Social Club, which has a six-lane bowling alley inside. After dinner, I was milling around outside, when all of a sudden I'm directed to move. I look to my left...and Kenny Chesney's tour bus pulls up. He has a group of fans waiting there for him; I agreed with one of the beer servers that Kenny himself wasn't on the bus. After wondering for a while where I should go, I tried out Howl at the Moon, a dueling piano bar. The pianos were cool, but the place didn't have quite the scene I sought, if you take my meaning. Since the cover charge I paid would also get me into a place called Saddle Ridge upstairs, I headed there. As the name implies, this was a country and western-themed place. While inside, I met another guy on a road trip, who didn't think the scene measured up to that at his alma mater, Cal State - Chico. There were many women who availed themselves of the bar as an alternate dancing surface. But the shock of the night was right around midnight, when I saw a group of people line dancing...to a hip-hop song. I don't remember what the song was, but it felt unnatural to see that sort of a contrast. Mr. Carberry, would you mind opening the door for security, please? I opened my door to see a large black man there, asking me to lower the volume. I did so, and finally drifted off to sleep a few minutes later. I was more than pleased with the 'Ville, and I'm glad I set up to be there on a Friday. A great opening to the opening weekend of the PNR.